Death of a loved one is one of the pathetic and unwelcoming situations in life and you may not know what to say at a funeral and what not to utter. Remember words play a very crucial role in that catastrophic period. Uttering insensitive words may show disrespect to the demised and hurt the sentiment of the departed person’s family. You may feel awkward to visit a crematorium ceremony because it may be hard for you to convey condolence in a correct way, but attending the funeral is necessary to show your care and concern for the mourning person. Your kind words should be consoling and your behavior should show honest support to the grieving person and the family. If you have a lack of knowledge about cremation etiquettes, brush up the ideas on what to say and what not at a funeral. A funeral is a somber event, where people whisper the words of sympathy and recalls the memories of the deceased. It will be wise to be a good listener first then reveal your sympathy and concern to the person who lost his or her loved one. Expressing a mundane comment can be against the funeral etiquette. People often get nervous at those situations! That’s why we have made a list of the perfect words to say at a funeral. The fond memories of your elder brother cannot be forgotten. May the good God provide comfort to the soul. Recall the memories of the demised person and pray for him or her. The above quote is the perfect example of recalling the memories. Your mother was a talented dancer and she will always be alive among us with her superb performances. Praising the talent and skills of the deceased person in front of his family would always being a smile and contentment to their heart. Whenever you need my help in this gloomy period, you will find my hands holding you tightly. Offer help to your mourning friend by saying something like the above. I cannot see you in this drastic condition. I will pray for you. Show a sign of empathy for the mourning friend. Weep as much as you want, so that your pain gets washed with the tears. I am there to hold you with my warm hugs. Help the gloomy person to flash out his or her tears by saying something that can connect the person to your true care! I know I cannot take the void place of your sister, but I want to share a moment of your life like your sister did on her presence. Honest regards and love for you my dear. Make the family of the demised feel your presence and true concern with the words. Our history sir was the best teacher in our school. I will love him and his memory forever. Express your affection for the departed person by recalling the individual. May the Heavenly God provide comfort to the soul of our aunt. Amen! Pray for the peace and salvation of the soul of the departed. Uncle John used to encourage me in sports and academics. Today, his death has snatched my motivation and encouragement from life. Sincere remembrance and condolence to uncle John. You can refer the demised by name and acknowledge his reminiscences. Tell how much you care and miss the demised person and display concern to the family. Dear friend, I still remember the aesthetic paintings of your younger brother. He is still among us with his skills and talent. Tom was not only the best friend but also a mentor and guide for me, who supported me in the difficult periods. His departure from the earth has made a hole in my heart. Appreciate the company of the departed person when he was among everyone. I will be glad if you accept the little sum of money at the name of your late grandfather. I will be honored if you receive the small amount. Offer financial support if the bereaved family is financially weak. Do not show pity in your words and be generous and polite. I am honestly feeling distressed because I cannot take your pain away but I know the Almighty will take away all your agony. 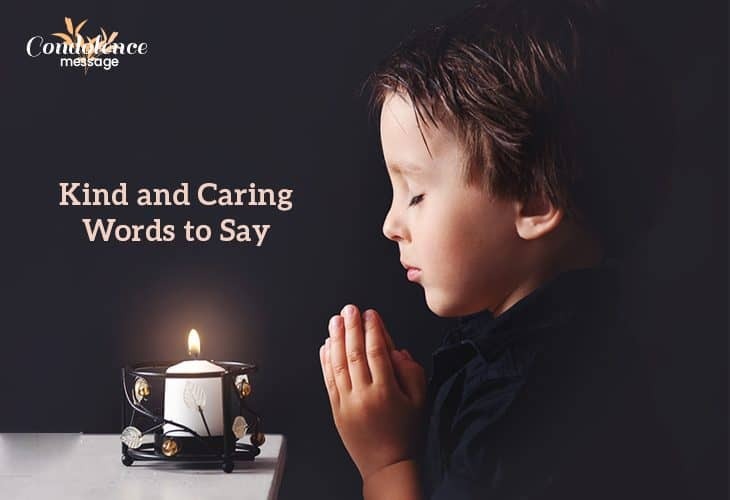 Use serene words in a low voice while attending a funeral and console your mourning friend by stating. I know you are facing a terrible condition but you need to take care of your family at this hard time. Please don’t skip foods because your children have already lost their dad and health issues of their mother will make them helpless. Try to guide the grieving person with advice to take care of his or her health for the sake of the other family members. I cannot accept this harsh truth. 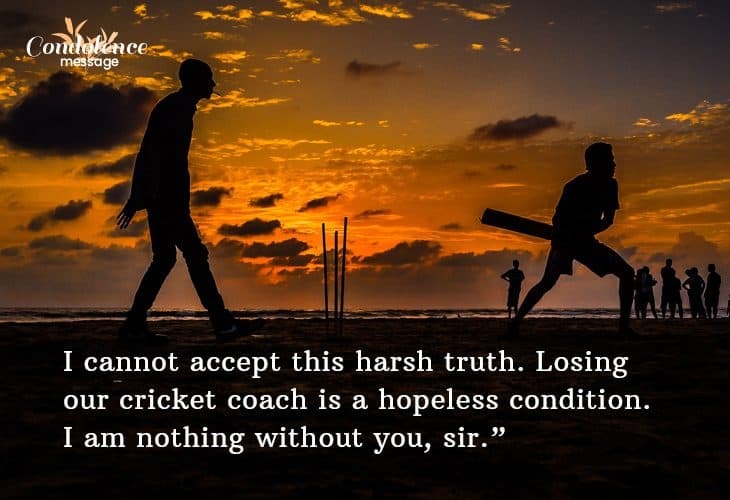 Losing our cricket coach is a hopeless condition. I am nothing without you, sir. Define the value of the departed person and shed your tears honestly. Earnestly sorry friend, I really cannot believe that am standing at the funeral event of our dear aunt. Your mom was such a kind lady and a mentor for me. I will pray for her soul. While attending a funeral, try to maintain silence and don’t start interacting immediately with the distressed family and take time to show concern. I won’t say much in this melancholy period. Just want to apologize. Whenever you want to talk and share your agony, you are free to call me anytime. I am always there for you. Give some space and time to the bereaved to get over from the traumatic condition and speak less by uttering. I may not replace the void place of your sister but I will try to be like your elder sister and do as much I can. My love and blessing are always with you my little brother. Offer sincere support and help by expressing your love and responsibility. Sorry for the demise of your dad, I want to tribute my earnest contribution by sharing responsibilities with you. Please define my duties and services for the crematorium. I will be glad if you allow me to do so. I really don’t know what to say, but I am really in distress. If you are unexpressive to reveal condolence then just show care by a short and simple sentence without elongating a sentence. I can still feel the presence of your sister in her paintings, and her study table in the drawing room. Express your grief to the inconsolable friend and show how you miss the person by the presence of his or her belongings. Have you taken your medicines in time? Don’t forget your mother always used to give you medicines after lunch. Now, I will give a phone call to remind you of the medicines. Show honest care by asking the need of the grieving person. Please allow me to contribute a fund to the old age home on the name of Julie aunty. It may provide solace to her soul. Take permission from the grieving family members for a noble contribution to the name of the demised. Please take your time and space and remember you are not alone, so call me when you are ready to talk. If the mourning person is in stressful and feeling annoyed while talking, do not disturb the individual. Do not misconstrue best-intended words in an incorrect way which can hurt someone. Your grandmother lived a long life and now it is their time to rest in peace. Don’t judge the longevity of any person whether he/she is old or young. Don’t lament, everything happens for a good reason. Stop saying insensitive words which have no reason to be uttered. How did your husband die so early? What happened to him? Don’t ask questions about the reason or circumstances of death at the funeral. Try to forget everything and move on. Stop giving the wrong comment which shows disrespect and concern to the deceased person. I heard the man was suffering from mental stress and he attempted suicide. Do not gossip about the dead person in the funeral with your friends and relatives present there. Uncle John is relieved from his pain now. He was suffering a lot in cancer. Please do not repent for his death. Don’t be thankful for someone’s death. I have to attend my meeting after going out of the funeral. Oh, my goodness! I am getting late. Rather than discussing other matters, focus on funeral and say words related to sympathy and concern. His presence was not beneficial to anyone. He used to torture his wife and daughters. Don’t give any negative comment about the departed person which shows disregard. I heard your nephew was a drug addicted and his addiction killed him. Is this true or not? Don’t report any unethical thing about the demised whether he has a bad past record or not. Your burden is uplifted now. Your mother-in-law was suffering from the chronic disease from many years and it was suffering and burden for you also. You should not be rude and judgmental. Nothing can be worse than the death of a closed one, so don’t use irrational lines. How long To Talk to the Bereaved Family Members? Now, you may have a query that how long to talk to the grieving family members. The time-span should depend on how close you are to the bereaved family. You can stand longer with them if you are imminent to them. However, if you are just an office colleague or a neighbor, express your care and sympathy in a polite way and leave for the day. Lengthy conversation is not the only mode to console; sometimes physical presence with generous gesture can also bring comfort to the people who lost their dear ones. The period after the funeral is one of the hardest times for the family members who have just lost a dear one. It may take many years to lead a normal life after the drastic incident. At that grieving moment, you need to do something special to offer your heartfelt condolence. 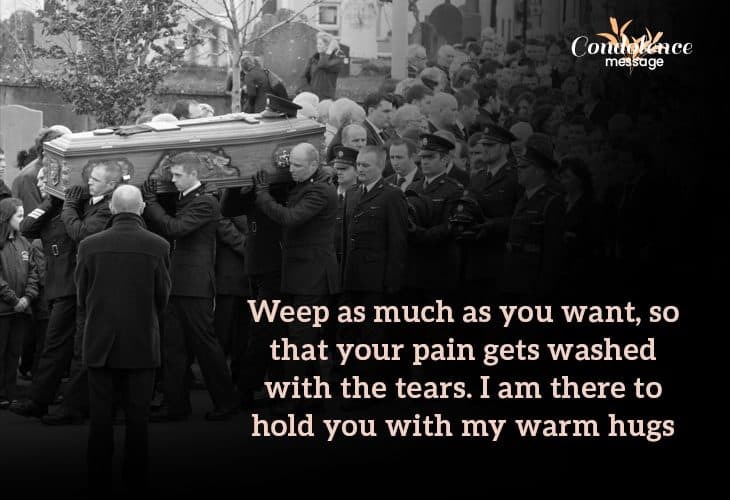 Send a small sympathy letter or note to the address of the bereaved family. Give a phone call and show empathy and care. Invite the family members to your house. Take them shopping or for a coffee. Try to engage them in the works they like. exactly what to say at a funeral. Your gentle words and fond behavior can heal the pain of a broken heart who has lost someone forever. Be with your loved ones during the dusky phase of life and express your honest sympathy rather than unpleasant terms. This can be the honest support to the family who have lost someone forever.